We’ve had Our DIY Camper for over a year now. 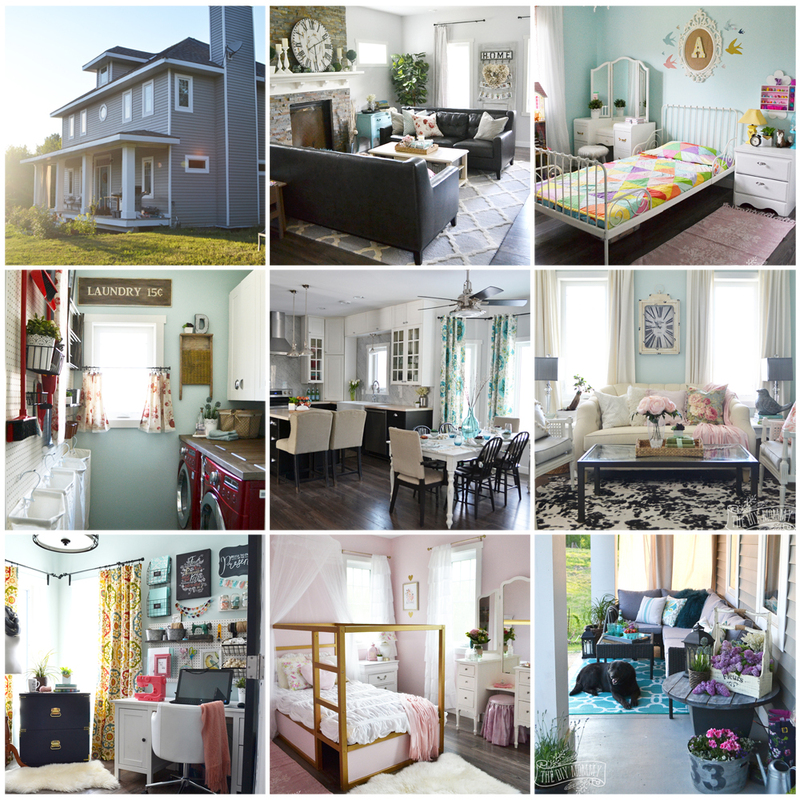 Come see how the renovations we’ve made have held up so far and how I’ve styled it for 2018. 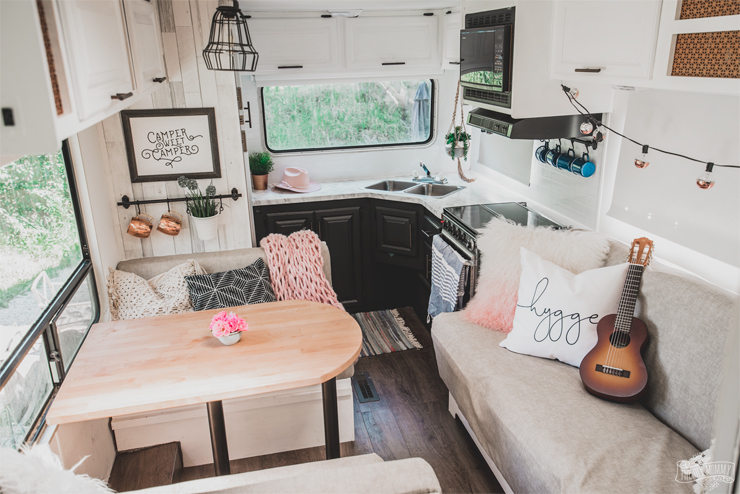 If you were to ask me what my most favourite DIY that I’ve ever done is, my answer would be: Our DIY Camper. 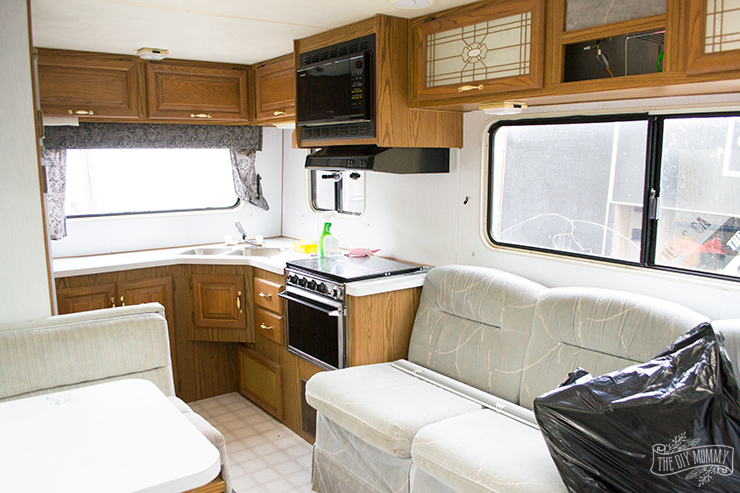 First, the before and after views of the RV are night & day! That’s always so satisfying. And second and most importantly, our family has made a ton of fabulous memories with our camper already. It’s allowed us to travel and explore our country for a lot less than buying a new camper or staying in hotels. 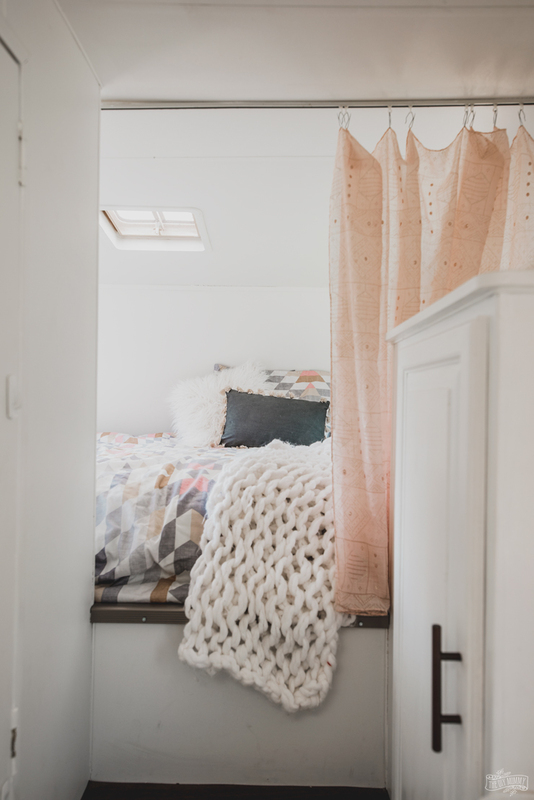 We’ve LOVED Our DIY Camper! Overall, I’ve been very pleased with how all our renovations have held up over this last year. We experience extreme temperature changes here (from -30 C to +30 C within a year), and the finishes have held up great! Come take the “before” tour right here. Come see last year’s tour right here. 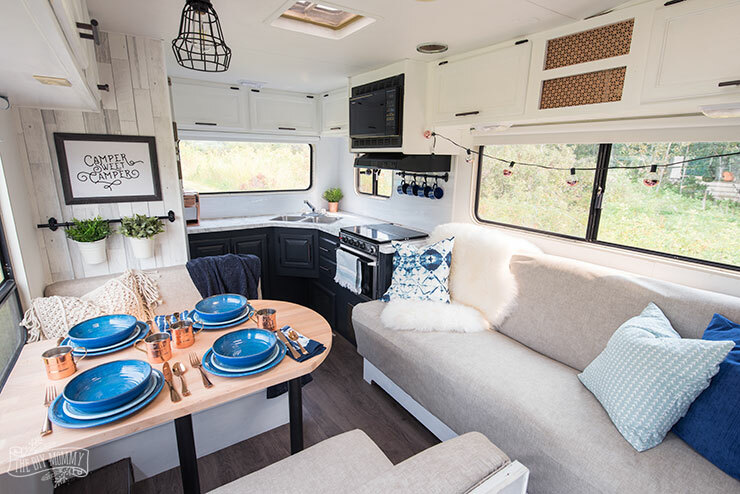 See how we renovated the camper kitchen right here. I’m often asked about the peel & stick tile, countertops & the wallpaper in here, and it all still looks brand new minus a little corner of one of the pieces of wallpaper. It started to peel off a little, and I fixed it with a little more wallpaper paste. 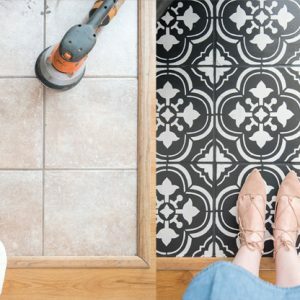 Otherwise, I’m so happy with the tile, the counters, the flooring… all of it! We also had a little mishap when driving back from our latest camping trip when a piece of our siding ripped off in the wind (YIKES! ), but we’re hoping to fix that this week and get back on the road. The joys of old campers! 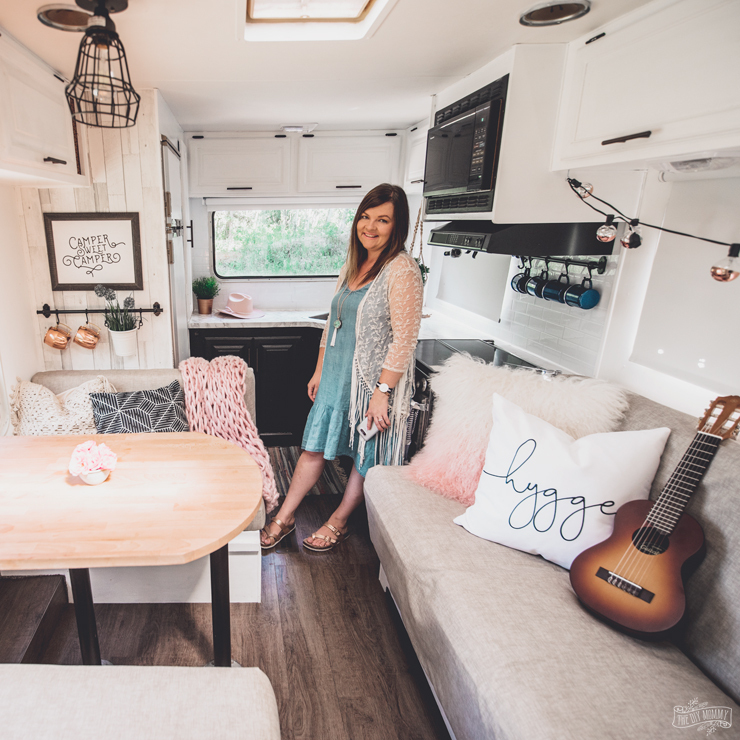 See how I slipcovered the jackknife sofa here and how I reupholstered the dinette cushions right here. The painted cabinets have held up beautifully. I attribute that to the generous coat of Varathane Polyurethane that I applied on all of the cabinets to keep them from chipping. It’s really the best to protect painted items that get a lot of use! 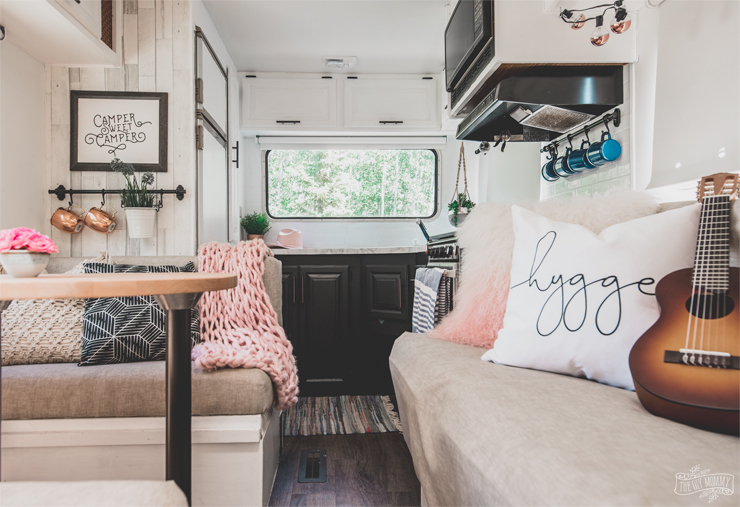 For this year, I’ve added a little bit of pink to the decor in our camper, and kept all of the copper and some of the blue elements. 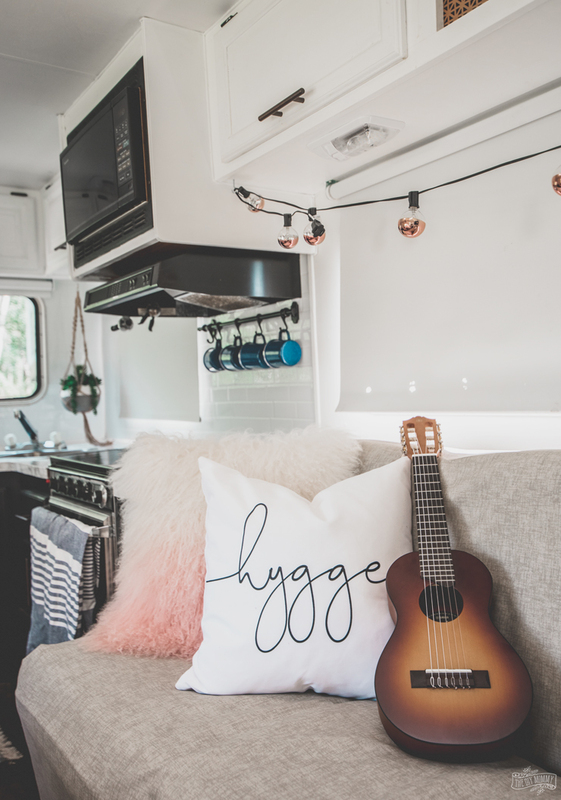 The “hygge” pillow is from my own collection, and we’ve also been taking this cute little guitelele from Amazon on our recent trips to learn to play some campfire songs! 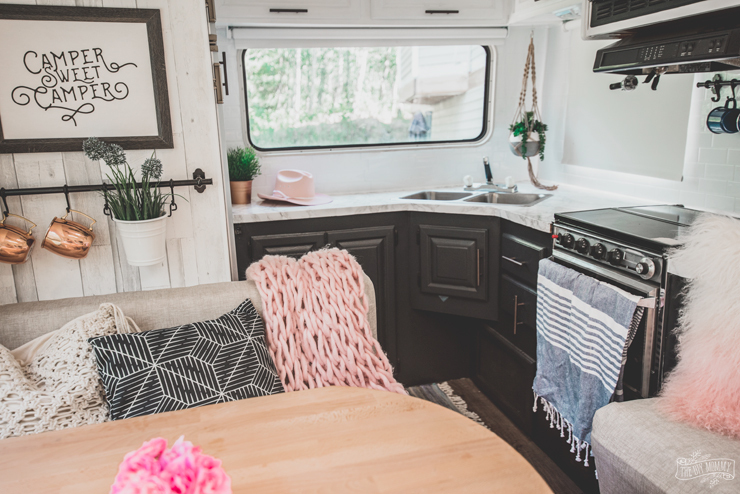 I was first inspired to put a little bit of blush pink into our camper’s decor this year when I found this pink, gold & grey duvet cover at Simons, and then I hung up a blush pink & rose gold scarf I had as a room divider. 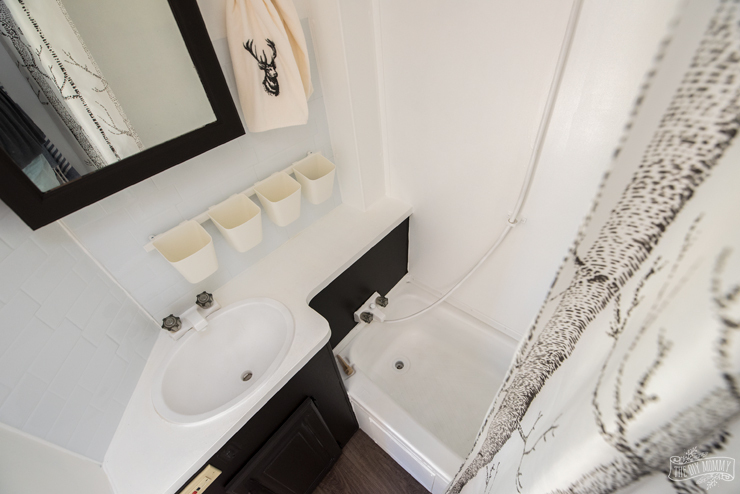 And don’t forget, I just renovated the tiny bathroom in here last month, and that’s been so much nicer to use this year! Thank you for coming along with me as I show you our camper this year! We just love it so much! Disclosure: This post contains affiliate links. 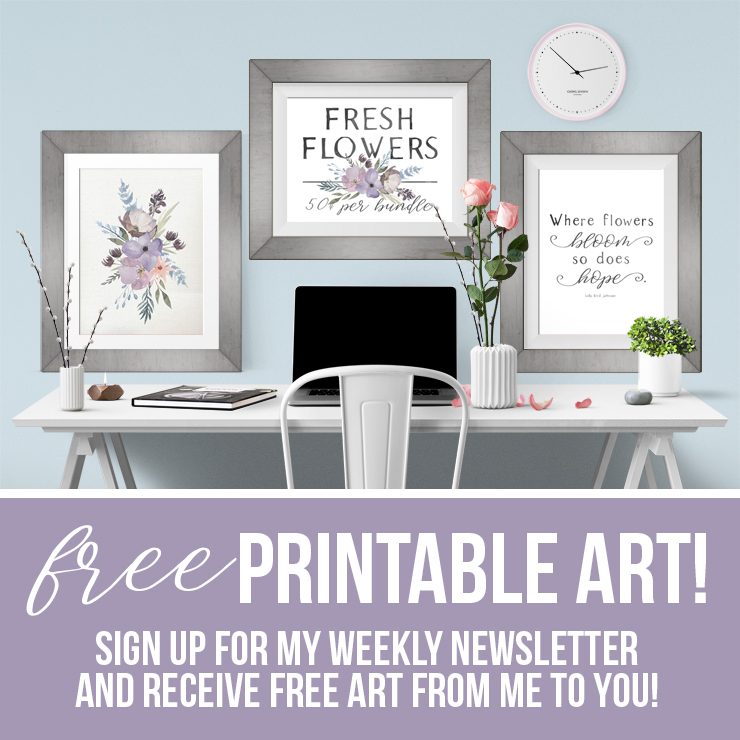 When you purchase a product via these links, I receive a small commission at no extra cost to you. I absolutely love it. You’ve done an amazing job. 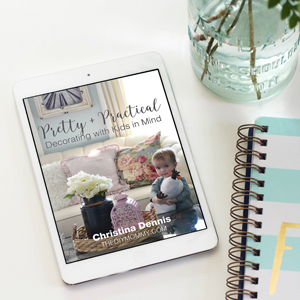 Hey Christina aka DIY Mommy! 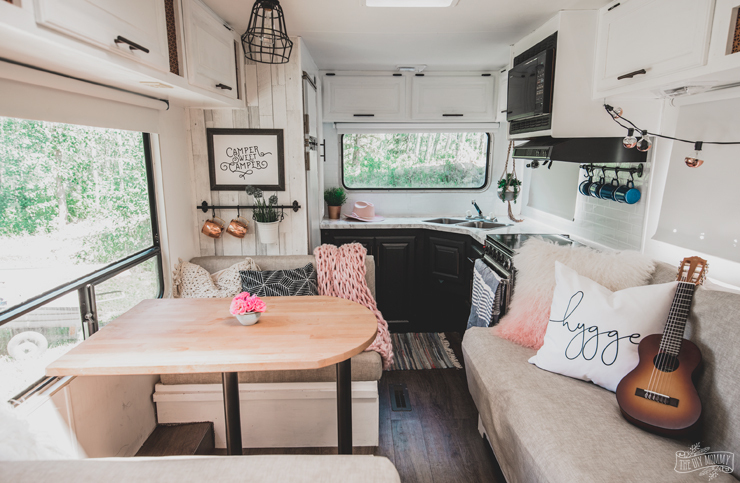 My friend & I found you on YouTube when we decided to renovate her older travel trailer. 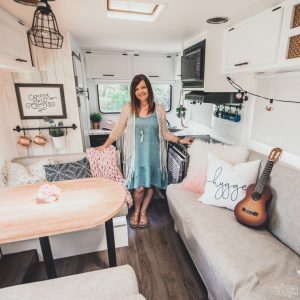 We followed & duplicated so many things you did to your RV especially your painting techniques/supplies! She is so happy with her little “get away on wheels” and we decided to call ourselves “DIY Grannies”!!! Thanks so much for all your inspiration! 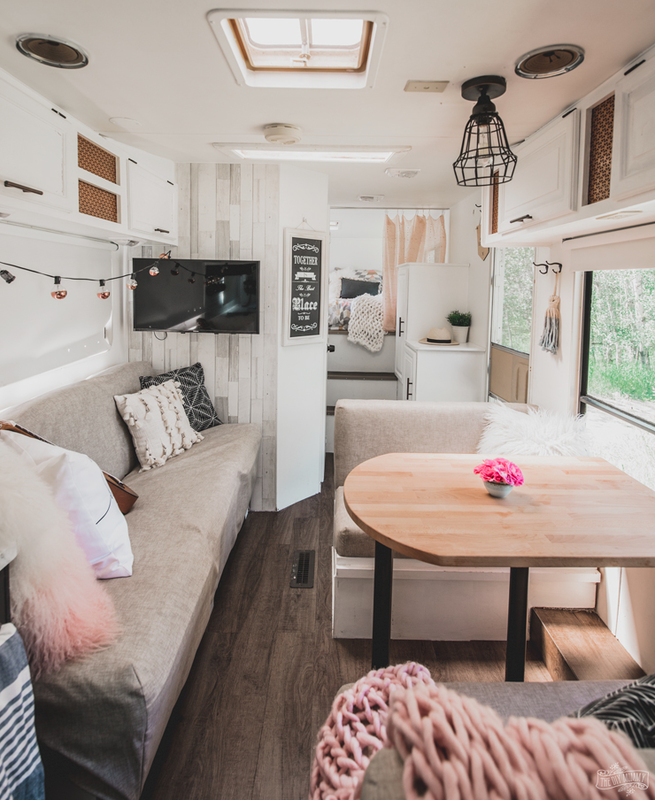 Your RV is beautiful!!! OMG. 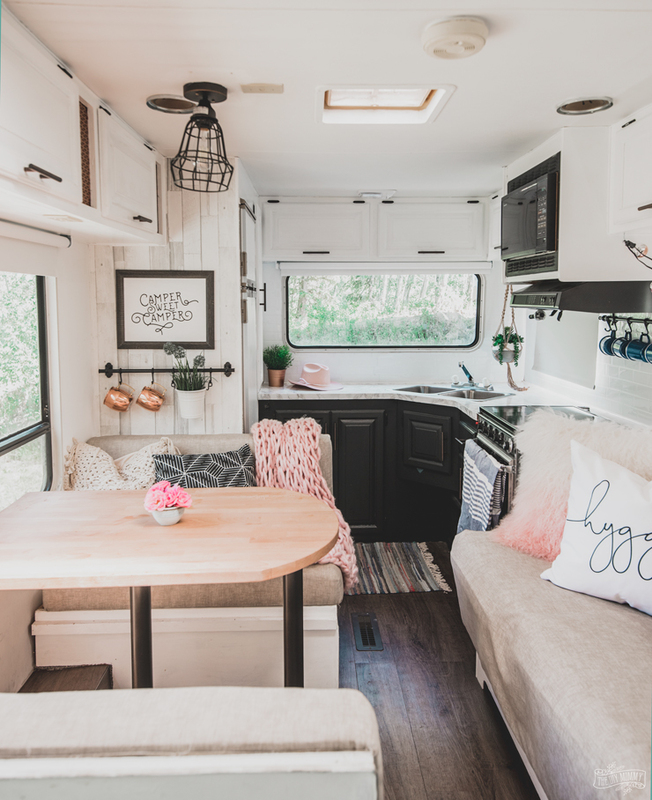 I am so in love with your camper. 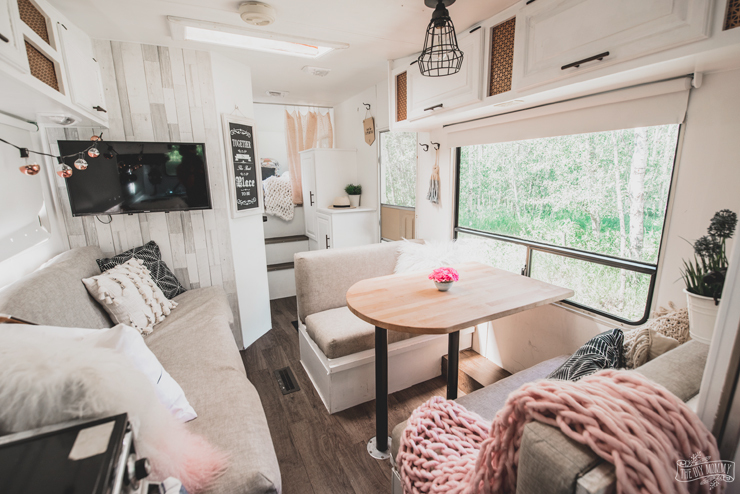 I recently redid our popup camper. This is inspiration for sure. Hey there Christina. Did you say that trailer was only 1000$?!! How on earth did you find a deal like that?! The trailer is gorgeous. It’s inspiring. 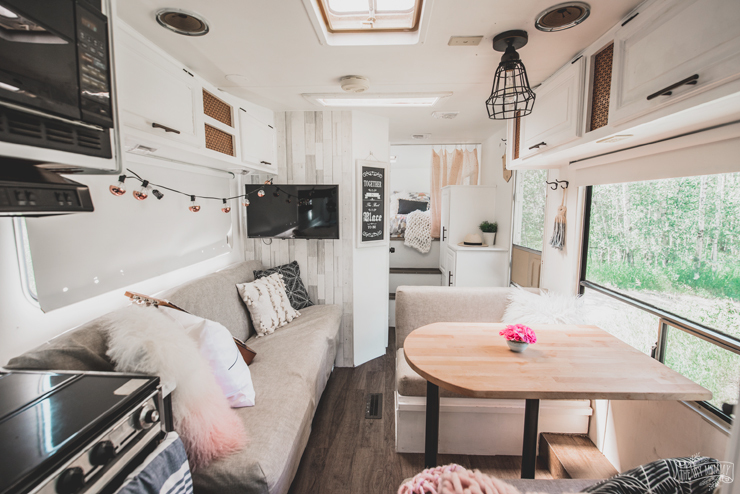 It makes living in a camper look purely blissful. Way to go!! I’m a prairie girl too, I looked last night on Kijiji and there’s NOTHING even close to that kind of deal! Thanks Janet! Christina did luck out on he trailer!! Important things that you have to bear in mind during the design process should be the wheels/tyres and suspension. The specifications of these things will definitely affect the overall body design and chassis of your camper trailer. & inspirations, as to what we can do with ours. are an artistic (camper) genius!!! Hi There! How is the tub and tile epoxy holding up? Does your family and yourself use the tub frequently?